Staff Side, NC(JCM) : Date of effect of Allowances- HRA, Transport Allowance, CEA etc. 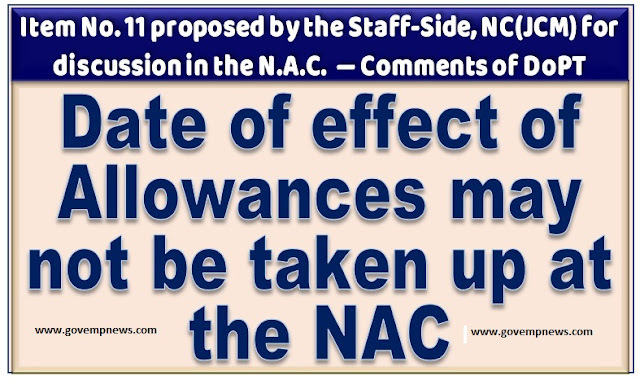 DoPT Comment: The Staff-Side has demanded that the grant of the allowances (revised) mentioned alongside should be made effective from 01.01.2016 and not from 01.07.2017. This is a demand and cannot be treated as an anomaly. Moreover, the date from which a benefit is to be made effective is something which can be decided only by the Government. Hence, this may not be taken up at the NAC.